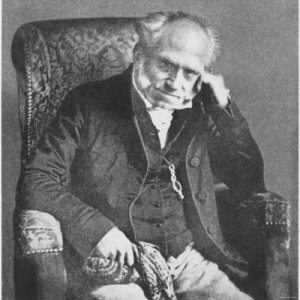 The following extract from On the Basis of Morality describes how, in Schopenhauer's Ethics, the cardinal virtue of Justice derives from Compassion; which as we have read in the preceding chapter, is the only true basis of Morality. On The Basis of Morality - Part III, Chapter VI, or §17. Translated by Arthur Brodrick Bullock. f we look more closely at this process called Compassion [Mitleid], which we have shown to be the primary ethical phenomenon, we remark at once that there are two distinct degrees in which another's suffering may become directly my motive, that is, may urge me to do something, or to leave it undone. The first degree of Compassion is seen when, by counteracting egoistic and malicious motives, it keeps me from bringing pain on another, and from becoming myself the cause of trouble, which so far does not exist. The other higher degree is manifested, when it works positively, and incites me to active help. The distinction between the so-called duties of law and duties of virtue, better described as justice and loving-kindness, which was effected by Kant in such a forced and artificial manner, here results entirely of itself; whence the correctness of the principle is attested. It is the natural, unmistakable, and sharp separation between negative and positive, between doing no harm, and helping. The terms in common use namely, "the duties of law" and " the duties of virtue" (the latter being also called "duties of love" or "imperfect duties") are in the first place faulty because they co-ordinate the genus with the species; for justice is one of the virtues. And next, they owe their origin to the mistake of giving a much too wide extension to the idea of Duty; which I shall reduce to its proper limits below. In place, therefore, of these duties I put two virtues; the one, justice, and the other, loving-kindness; and I name them cardinal virtues, since from them all others not only in fact proceed, but also may be theoretically derived. Both have their root in natural Compassion. And this Compassion is an undeniable fact of human consciousness, is an essential part of it, and does not depend on assumptions, conceptions, religions, dogmas, myths, training, and education. On the contrary, it is original and immediate, and lies in human nature itself. It consequently remains unchanged under all circumstances, and reveals itself in every land, and at all times. This is why appeal is everywhere confidently made to it, as to something necessarily present in every man; and it is never an attribute of the "strange gods." he first degree, then, in which this natural and genuine moral incentive shows itself is only negative, Originally we are all disposed to injustice and violence, because our need, our desire, our anger and hate pass into the consciousness directly, and hence have the Jus primi occupantis (The right of the first occupant). Whereas the sufferings of others, caused by our injustice and violence, enter the consciousness indirectly, that is, by the secondary channel of a mental picture, and not till they are understood by experience. Thus Seneca (Ep. 50) says: Ad neminem ante bona mens venit, quam mala (Good feelings never come before bad ones). In its first degree, therefore, Compassion opposes and baffles the design to which I am urged by the anti-moral forces dwelling within me and which will bring trouble on a fellow-being. It calls out to me: "Stop!" and encircles the other as with a fence, so as to protect him from the injury which otherwise my egoism or malice would lead me to inflict on him. So arises out of this first degree of compassion the rule: Neminem laede (Do harm to no one). This is the fundamental principle of the virtue of justice, and here alone is to be found its origin, pure and simple, an origin which is truly moral, and free from all extraneous admixture. Otherwise derived, justice would have to rest on Egoism, a reductio ad absurdum. If my nature is susceptible of Compassion up to this point, then it will avail to keep me back, whenever I should like to use others' pain as a means to obtain my ends; equally, whether this pain be immediate, or an after-consequence, whether it be effected directly, or indirectly, through intermediate links. I shall therefore lay hands on the property as little as on the person of another, and avoid causing him distress, no less mental than bodily. I shall thus not only abstain from doing him physical injury, but also, with equal care I shall guard against inflicting on him the suffering of mind, which - mortification and calumny, anxiety and vexation so surely work. The same sense of Compassion will check me from gratifying my desires at the cost of women's happiness for life, or from seducing another man's wife, or from ruining youths morally and physically by tempting them to pederasty. Not that it is at all necessary in each single case that Compassion should be definitely excited; indeed it would often come too late; but rather the rule : Neminem laede, is formed by noble minds out of the knowledge, gained once for all, of the injury which every unjust act necessarily entails upon others, and which is aggravated by the feeling of having to endure wrong through a force majeure. Such natures are led by reflecting reason to carry out this principle with unswerving resolution. They respect the rights of every man, and abstain from all encroachment on them; they keep themselves free from self-reproach, by refusing to be the cause of others' trouble; they do not shift on to shoulders not their own, by force or by trickery, the burdens and sorrows of life, which circumstances bring to every one ; they prefer to bear themselves the portions allotted to them, so as not to double those of their neighbours. For although generalising formulae, and abstract knowledge of whatever kind, are not in the least the cause, or the real basis of morality; these are nevertheless indispensable for a moral course of life. They are the cistern or reservoir, in which the habit of mind, that springs from the fount of all morality (a fount not at all moments flowing), may be stored up, thence to be drawn off, as occasion requires. There is thus an analogy between things moral and things physiological; among many instances of which we need only mention that of the gall-bladder, which is used for keeping the secretion of the liver. Without firmly held principles we should inevitably be at the mercy of the anti-moral incentives, directly they are roused to activity by external influences; and self-control lies precisely in steadfast adherence and obedience to such principles, despite the motives which oppose them. n general, the feminine half of humanity is inferior to the masculine in the virtue of justice, and its derivatives, uprightness, conscientiousness, etc. ; the explanation is found in the fact that, owing to the weakness of its reasoning powers the former is much less capable than the latter of understanding and holding to general laws, and of taking them as a guiding thread. Hence injustice and falseness are women's besetting sins and lies their proper element. On the other hand, they surpass men in the virtue of loving-kindness; because usually the stimulus to this is intuitive, and consequently appeals directly to the sense of Compassion, of which females are much more susceptible than males. For the former nothing but what is intuitive, present, and immediately real has a true existence ; that which is knowable only by means of concepts, as for instance, the absent, the distant, the past, the future, they do not readily grasp. We thus find compensation here, as in so much else; justice is more the masculine, loving-kindness more the feminine virtue. The mere idea of seeing women sitting on the judges' bench raises a smile; but the sisters of mercy far excel the brothers of charity. Now animals, as they have no power of gaining knowledge by reason, that is, of forming abstract ideas, are entirely incapable of fixed resolutions, to say nothing of principles; they consequently totally lack self-control, and are helplessly given over to external impressions and internal impulses. This is why they have no conscious morality; although the different species show great contrasts of good and evil in their characters, and as regards the highest races these are traceable even in individuals. rom the foregoing considerations we see that in the single acts of the just man Compassion works only indirectly through his formulated principles, and not so much actu as potentid; much in the same way as in statics the greater length of one of the scale-beams, owing to its greater power of motion, balances the smaller weight attached to it with the larger on the other side, and works, while at rest, only potentid, not actu; yet with the same efficiency. evertheless, Compassion is always ready to pass into active operation. Therefore, whenever, in special cases, the established rule shows signs of breaking down, the one incentive (for we exclude of course those based on Egoism), which is capable of infusing fresh life into it, is that drawn from the fountain-head itself Compassion. This is true not only where it is a question of personal violence, but also where property is concerned, for instance, when any one feels the desire to keep some valuable object which he has found. In such cases, if we set aside all motives prompted by worldly wisdom, and by religion nothing brings a man back so easily to the path of justice, as the realisation of the trouble, the grief, the lamentation of the loser. It is because this is felt to be true, that, when publicity is given to the loss of money, the assurance is so often added that the loser is a poor man, a servant, etc. t is hoped that these considerations have made it clear that, however contrary appearances may be at first sight, yet undoubtedly justice, as a genuine and voluntary virtue has its origin in Compassion. But if anyone should suppose such a soil too barren and meagre to bear this great cardinal virtue, let him reflect on what is said above, and remember how small is the amount of true, spontaneous, unselfish, unfeigned justice among men; how the real thing only occurs as a surprising exception, and how, to its counterfeit, the justice that rests on mere worldly wisdom and is everywhere published abroad it is related, both in quality and quantity, as gold is to copper. I should like to call the one δικαιοσὐνη πάνδημος (earthly justice), the other οὺρανία (heavenly justice). e have seen that "wrong" and " right" are convertible synonyms of "to do harm" and "to refrain from doing it" and that under "right" is included the warding off of injury from oneself. It will be obvious that these conceptions are independent of, and antecedent to, all positive legislation. There is, therefore, a pure ethical right, or natural right, and a pure doctrine of right, detached from all positive statutes. The first principles of this doctrine have no doubt an empirical origin, so far as they arise from the idea of harm done, but per se they rest on the pure understanding, which a priori furnishes ready to hand the axiom: causa causae est causa effectits (The cause of a cause is the cause of the effect)). Taken in this connection the words mean: if any one desires to injure me, it is not I, but he, that is the cause of whatever I am obliged to do in self-defence; and I can consequently oppose all encroachments on his part, without wronging him. Here we have, so to say, a law of moral repercussion. Thus it comes about that the union of the empirical idea of injury done with the axiom supplied by the pure understanding, gives rise to the fundamental conceptions of wrong and right, which everyone grasps a priori, and learns by actual trial to immediately adopt. The empiric, who denies this, and refuses to accept anything but the verdict of experience, may be referred to the testimony of the savage races, who all distinguish between wrong and right quite correctly, often indeed with nice precision ; as is strikingly manifested when they are engaged in bartering and other transactions with Europeans, or visit their ships. They are bold and self-assured, when they are in the right; but uneasy, when they know they are wrong. In disputes a just settlement satisfies them, whereas unjust procedure drives them to war. The Doctrine of Right is a branch of Ethics, whose function is to determine those actions which may not be performed, unless one wishes to injure others, that is, to be guilty of wrong-doing; and here the active part played is kept in view. But legislation applies this chapter of moral science conversely, that is, with reference to the passive side of the question, and declares that the same actions need not be endured, since no one ought to have wrong inflicted on him. To frustrate such conduct the state constructs the complete edifice of the law, as positive right. Its intention is that no one shall suffer wrong; the intention of the Doctrine of Moral Right is that no one shall do wrong. 3 If by unjust action I molest someone, whether in his person, his freedom, his property, or his honour, the wrong as regards quality remains the same. But with respect to quantity it may vary very much. This difference in the amount of wrong effected appears not to have been as yet investigated by moralists, although it is everywhere recognised in real life, because the censure passed is always proportional to the harm inflicted. So also with just actions, the right done is constant in quality, but not in quantity To explain this better : he, who when dying of starvation steals a loaf, commits a wrong ; but how small is this wrong in comparison with the act of an opulent proprietor, who, in whatever way, despoils a poor man of his last penny! Again: the rich person who pays his hired labourer, acts justly; but how insignificant is this piece of justice when contrasted with that of a penniless toiler, who voluntarily returns to its wealthy owner a purse of gold which he has found! The measure, however, of this striking difference in the quantity of justice, and injustice (the quality being always constant), is not direct and absolute, as on a graduated scale; it is indirect and relative, like the ratio of sines and tangents. I give therefore the following definition: the amount of injustice in my conduct varies as the amount of evil, which I thereby bring on another, divided by the amount of advantage, which I myself gain ; and the amount of justice in my conduct varies as the amount of advantage, which injury done to another brings me, divided by the amount of harm which he thereby suffers. e have further to notice a double form of injustice which is specifically different from the simple kind, be it never so great. This variety may be detected by the fact that the amount of indignation shown by disinterested witnesses, which is always proportional to the amount of wrong inflicted, never reaches the maximum except when it is present. We then see how the deed is loathed, as something revolting and heinous, as an ἅγος (i.e., abomination), before which, as it were, the gods veil their faces. Double injustice occurs when someone, after definitely undertaking the obligation of protecting his friend, master, client, etc., in a special way, not only is guilty of non-fulfilment of that duty (which of itself would be injurious to the other, and therefore a wrong); but when, in addition, he turns round, and attacks the man, and strikes at the very spot which he promised to guard. Instances are: the appointed watch, or guide, who becomes an assassin; the trusted caretaker, who becomes a thief; the guardian, who robs his ward of her property; the lawyer, who prevaricates; the judge, who is corruptible; the adviser, who deliberately gives some fatal counsel. All such conduct is known by the name of treachery, and is viewed with abhorrence by the whole world. Hence Dante puts traitors in the lowest circle of Hell, where Satan himself is found (Inferno: Canto xi, 61-66). we have here had occasion to mention the word "obligation", this is the place to determine the conception of Duty [Pflicht], which is so often spoken of both in Ethics and in real life, but with too wide an extension of meaning. We have seen that wrong always signifies injury done to another, whether it be in his person, his freedom, his property, or his honour. The consequence appears to be that every wrong must imply a positive aggression, and so a definite act. Only there are actions, the simple omission of which constitutes a wrong; and these are Duties. This is the true philosophic definition of the conception "Duty", a term which loses its characteristic note, and hence becomes valueless, if it is used (as hitherto it has been in Moral Science) to designate all praiseworthy conduct. It is forgotten that "Duty" 4 necessarily means a debt which is owing, being thus an action, by the simple omission of which another suffers harm, that is, a wrong comes about. Clearly in this case the injury only takes place through the person, who neglects the duty, having distinctly pledged or bound himself to it. Consequently all duties depend on an obligation which has been entered into. This, as a rule, takes the form of a definite, if some- times tacit, agreement between two parties: as for instance, between prince and people, government and its servants, master and man, lawyer and client, physician and patient; in a word, between any and every one who undertakes to perform some task, and his employer in the widest sense of the word. Hence every duty involves a right; since no one undertakes an obligation without a motive, which means, in this case, without seeing some advantage for himself. There is only one obligation that I know of which is not subject to an agreement, but arises directly and solely through an act; this is because one of the persons with whom it has to do was not in existence when it was contracted. I refer to the duty of parents towards their children. Whoever brings a child into the world, has incumbent on him the duty of supporting his offspring, until the latter is able to maintain himself; and should this time never come, owing to incapacity from blindness, deformity, cretinism, and the like, neither does the duty ever come to an end. It is clear that merely by failing to provide for the needs of his son, that is, by a simple omission, the father would injure him, indeed jeopardise his life. Children's duty towards their parents is not so direct and imperative. It rests on the fact that, as every duty involves a right, parents also must have some just claim on their issue. This is the foundation of the duty of filial obedience, which, however, in course of time ceases simultaneously with the right out of which it sprang. It is replaced by gratitude for that which was done by father and mother over and above their strict duty. Nevertheless, although ingratitude is a hateful, often indeed a revolting vice, gratitude cannot be called a duty; because its omission inflicts no injury on the other side, and is therefore no wrong. Otherwise we should have to suppose that in his heart of hearts the benefactor aims at making a good bargain. It should he noticed that reparation made for harm done may also be regarded as a duty arising directly through an action. This, however, is something purely negative, as it is nothing but an attempt to remove and blot out the consequences of an unjust deed, as a thing that ought never to have taken place. Be it also observed that equity l is the foe of justice, and often comes into harsh collision with it ; so that the former ought only to be admitted within certain limits. The German is a friend of equity, while the Englishman holds to justice. he law of motivation is just as strict as that of physical causality, and hence involves the same irresistible necessity. Consequently wrong may be compassed not only by violence, but also by cunning. If by violence I am able to kill or rob another, or compel him to obey me, I can equally use cunning to accomplish the same ends; that is, I can place false motives before his intellect, by reason of which he must do what otherwise he would not. These false motives are effected by lies. In reality lies are unjustifiable solely in so far as they are instruments of cunning, in other words, of compulsion, by means of motivation. 5 And this is precisely their function, as a rule. For, in the first place, I cannot tell a falsehood without a motive, and this motive will certainly be, with the rarest exceptions, an unjust one ; namely, the intention of holding others, over whom I have no power, under my will, that is, of coercing them through the agency of motivation. Also in mere exaggerations and untruthful bombast there is the same purpose at work; for, by employing such language, a man tries to place himself higher in the sight of others than is his due. The binding force of a promise or a compact is contained in the fact that, if it be not observed, it is a deliberate lie, pronounced in the most solemn manner, a lie, whose intention (that of putting others under moral compulsion) is, in this case, all the clearer, because its motive, the desired performance of something on the other side, is expressly declared. Vita mortal, tutta d'invidia piena. may, then, without any injustice match cunning with cunning, and anticipate all crafty encroachments on me, even if they be only probable; and I need neither render an account to him who unwarrantably pries into my personal circumstances, nor by replying: "I cannot answer this," show him the spot where I have a secret, which perilous to me, and perhaps advantageous to him, in any case puts me in his power, if divulged: Scire volunt secreta domus, atque inde timeri (They wish to know family secrets, and thus become feared). Juvenal, Satires, 3 v.113). On the contrary, I am justified in putting him off with a lie, involving danger to himself, in case he is thereby led into a mistake that works him harm. Indeed, a falsehood is the only means of opposing inquisitive and suspicious curiosity; to meet which it is the one weapon of necessary self-defence. Ask me no questions, and I'll tell you no lies is here the right maxim. For among the English, who regard the reproach of being a liar as the deepest insult, and who on that account are really more truthful than other nations, all unjustifiable questions, having to do with another's affairs, are looked upon as a piece of ill-breeding, which is denoted by the expression, "to ask questions." Certainly every sensible person, even when he is of the strictest rectitude, follows the principle above set forth. Suppose, for instance, such a one is returning from a remote spot, where he has raised a sum of money; and suppose an unknown traveller joins him, and after the customary "whither" and "whence" gradually proceeds to inquire what may have taken him to that place; the former will undoubtedly give a false answer in order to avoid the danger of robbery. Again: if a man be found in the house of another, whose daughter he is wooing; and he is asked the cause of his unexpected presence; unless he has entirely lost his head, he will not give the true reason, but unhesitatingly invent a pretext. And the cases are numberless in which every reasonable being tells an untruth, without the least scruple of conscience. It is this view of the matter alone that removes the crying contradiction between the morality which is taught and that which is daily practised, even by the best and most upright of men. At the same time, the restriction of a falsehood to the single purpose of self-defence must be rigidly observed; for otherwise this doctrine would admit of terrible abuse, a lie being in itself a very dangerous instrument. But just as, even in time of public peace, the law allows everyone to carry weapons and to use them, when required for self-defence, so Ethics permits lies to be employed for the same purpose and be it observed for this one purpose only. Every mendacious word is a wrong, excepting only when the occasion arises of defending oneself against violence or cunning. Hence justice requires truthfulness towards all men. But the entirely unconditional and unreserved condemnation of lies, as properly involved in their nature, is sufficiently refuted by well-known facts. Thus, there are cases where a falsehood is a duty, especially for doctors; and there are magnanimous lies, as, for instance, that of the Marquis Posa in Don Carlos 7or that in [Tasso's] Gerusalemme Liberata, II, 22; 8they occur, indeed, whenever a man wills to take on himself the guilt of another; and lastly, Jesus Christ himself is reported (John 7:8) on one occasion to have intentionally told an untruth. The reader will remember that Campanella, in his Poesie Filosofiche (Delia Bellezza: Madr.9), does not hesitate to say: Bello il mentir, se a fare gran ben' si trova. 9On the other hand, the current teaching as regards necessary falsehoods is a wretched patch on the dress of a poverty-stricken morality. Kant is responsible for the theory found in many text-books, which derives the unjustifiableness of lies from man's faculty of speech; but the arguments are so tame, childish and absurd that one might well be tempted, if only to pour contempt on them, to join sides with the devil, and say with Talleyrand: L'homme a recu la parole pour pouvoir cacher sa pensée . 10 The unqualified and boundless horror shown by Kant for falsehoods, whenever he has the opportunity, is due either to affectation, or to prejudice. In the chapter of his "Tugendlehre" [Doctrine of Virtue] dealing with lies, he loads them with every kind of defamatory epithet, but does not adduce a single adequate reason for their condemnation; which would have been more to the point. Declamation is easier than demonstration, and to moralise less difficult than to be sincere. Kant would have done better to open the vials of his wrath on that vice which takes pleasure in seeing others suffer; it is the latter, and not a falsehood, which is truly fiendish. or malignant joy [Schadenfreude]11 is the exact opposite of Compassion, and nothing else but powerless cruelty, which, unable itself to bring about the misery it so gladly beholds others enduring, is thankful to chance for having done so instead. According to the code of knightly honour, the reproach of being a liar is of extreme gravity, and only to be washed out with the accuser's blood. Now this obtains, not because the lie is wrong in itself, since, were such the reason, to accuse a man of an injury done by violence would certainly be regarded as equally outrageous, which is not the case, as everyone knows; but it is due to that principle of chivalry, which in reality bases right on might; so that whoever, when trying to work mischief, has recourse to falsehood, proves that he lacks either power, or the requisite courage. Every untruth bears witness of his fear; and this is why a fatal verdict is passed on him.